Late January this year, I told a new friend that I have been “loving Little Red lately” — he’s Australian and conveniently from Melbourne, so he didn’t need any introductions. The five-piece band came from the same side of Australia and was mildly popular early on when they won Virgin Mobile’s “Garage to V”, a contest that gives the winning band a slot to the Australian V Festival. 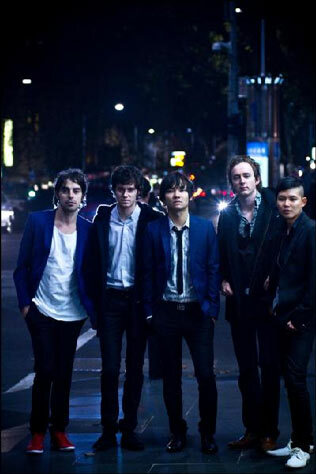 Since then, the band has performed at several festivals including the Big Day Out and Laneway. To my regret, they were in SG last year for Laneway’s debut. Now, Midnight Remember is the first album that I’ve heard from the group. I understand that this is already their sophomore album, so I can not fully comment on the band’s growth re: musical style or anything. I stumbled upon Little Red through Indie Initiative, and was fortunate enough to hear their single “All Mine” first. I say that this is the type of track that could lure a listener into the depths we call more. Two minutes and fifty-seven seconds later, I was already drowning in bliss mixed with urgency and curiosity. Who is Little Red? Why haven’t I heard of them before? Did someone else know about them before me? (Well, besides the Aussies, duh.) Are there more tracks? There are. In a week, I had Midnight Remember stored in my player and I listened to it every morning before I go to work, and every night, on my way home. Surprisingly, the tracks are not the kind that drones on and on to the point that one song is no longer distinguishable from the other. At one point, you might wonder if you’re even listening to the same album. See, Little Red swaps lead singers – at times, Adrian Beltrane takes over, but most of the time, it’s Dominic Byrne that croons. There’s a noticeable shift of sound, too, when you get to Track 7: “A Place Called Love”, but you enjoy it otherwise. Overall, Midnight Remember has a youthful feel – catchy choruses, tracks that could make you bop your head – and a distinct sound that screams Little Red. Early favorites include “Slow Motion”, “Rock It”, “Little Bit of Something”, and “Get A Life”. True enough, Midnight Remember was well-received in Australia. It was also released late last year in the US. I’m not sure how they did there, but word is, “All Mine” is/or will be (?) featured on a TV show (“A Gifted Man” starring Patrick Wilson), so it seems like the band is bound for (further) success and recognition. I did raise those chances by posting this though.